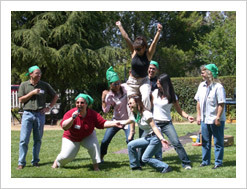 With over 25 years of team-building experience in the San Francisco Bay Area, California, and the U.S., TeamBuilding Unlimited will work with you to meet the needs of your team in this changing emotional and financial climate. Janet Rudolph and Frank Price and our trained facilitators will guide you through each teambuilding event, keep teams on track and assist in any and every way necessary to insure your participants get the most out of every team building event. All TeamBuilding Unlimited activities and events are created in consultation with our clients to reflect their goals and objectives, agenda, specific jargon and buzzwords. 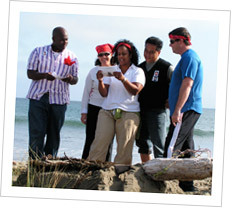 Each team building activity will include an introduction and debriefing by our energetic facilitators. We create win-win events! Clients can choose from an array of dynamic customized indoor and outdoor activities—or we’ll work with you to create something entirely new and different. From a Charity Challenge to a Green Teambuilding event to a Corporate Grand Prix, your group will experience Team Building Change in a new and exciting way! Teambuilding Unlimited will work in any location of your choice delivering on-site activities and events for groups for 5 to 500! All Content © TeamBuilding Unlimited. Web site by interbridge. Banner by Golden Sage Creative.